Combine the water and sugar in a small saucepan. Simmer gently until the sugar is dissolved. Pour this sugar syrup into the pomegranate juice. Taste and adjust the acidity with a squeeze of lime, if needed. Pour the mixture into a bowl, and freeze. After about 1 hour, stir the mixture to prevent separation of the juice and syrup. Once the mixture is frozen, chop it up with a knife or ice pick. Transfer the ice to a smaller container, and store it tightly covered in the freezer until served. Nutrients per Serving (2 oz. 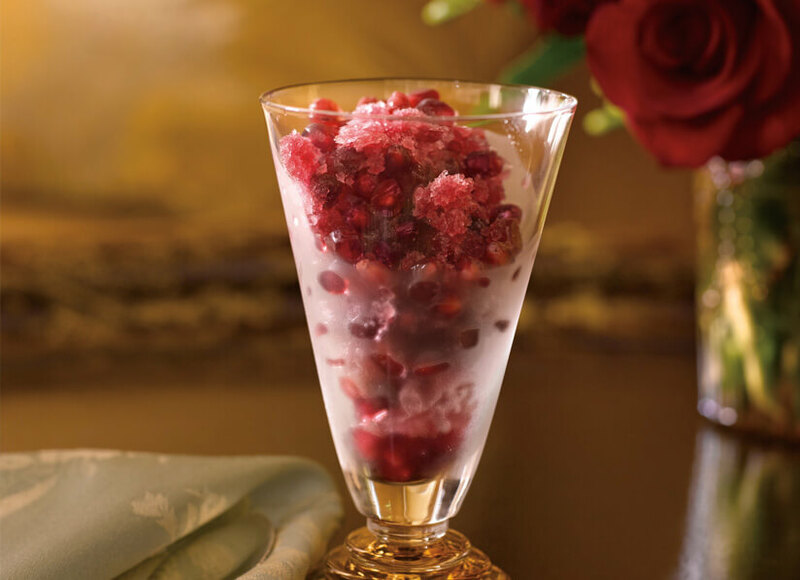 granita): 84 calories (0 calories from fat), 1g protein, 0g total fat (0g saturated), 21g carbohydrates, <1g dietary fiber, 0mg cholesterol, 21g total sugars, 0mcg vitamin A RE, 8mg sodium, 3mg potassium, 1mg vitamin C. Time to table: 5 min prep, 1 hour freezing Makes 6 to 8 servings. Copyright © Pomegranate Council. All rights reserved.